The Encore is Buick’s smallest crossover. It’s been in production for four years now but for 2017 company decided it needed some updates just to keep buyers interested in the car. Staying at the top in this segment, or just being competitive as a matter of fact is a big task. The class is filled with lots of brilliant models from different manufacturers all wanting a slice of the cake in this highly competitive market. Buick’s Encore has been a massive success for GM. It sold in 67,500 examples just in 2015 alone. That’s more than a 50 percent increase from 2013. When you know that statistically every third vehicle to leave a Buick showroom is an Encore, it’s no surprise that they’ve decided to give it some needed upgrades. Upgrades like a new face improved interior and new technology. Nothing major in term of improvements, but enough to bring the Encore a level higher. Starting with the exterior, you’ll notice it’s not the same car from 2016. In fact, it’s not even similar looking from the front. There is a new grille which has the new Buick tri-color emblem rather than the old silver one. The headlights are new as is the restyled fog light units. Higher trim levels receive full LED headlights but they’re not really that necessary. They definitely look cool however giving this car new touch and more appeal. LED technology can be found at the back on every trim level thanks to LED tail lights while the exhaust tip is new, clear improvement but not to an extent we could call it a revolution. The mirrors are now body-colored with integrated indicators and have a heated glass for your convenience. 18-inch wheels are available, and there’s a bigger color palette thanks to the addition of three new color options. There’s Black Cherry Metallic, White Frost Metallic and Ebony Twilight Metallic. It might not be the best looking car, but, it’s not bad, is it? It doesn’t appear aggressive or mean, but rather banks more on the cutesy card. The overall appearance is that of a minimized midsize SUV although it still feels very high. It’s shorter and thinner than a bigger SUV, but weirdly it seems to be taller thanks to the upright body style although in reality it isn’t. Should you go for the LED headlights, you’ll be in for a treat since they do manage to complete the overall look of the car. The interior of the Encore is typical Buick. It keeps the same overall shape, but the dashboard received a redesign and the materials used now are of higher quality. 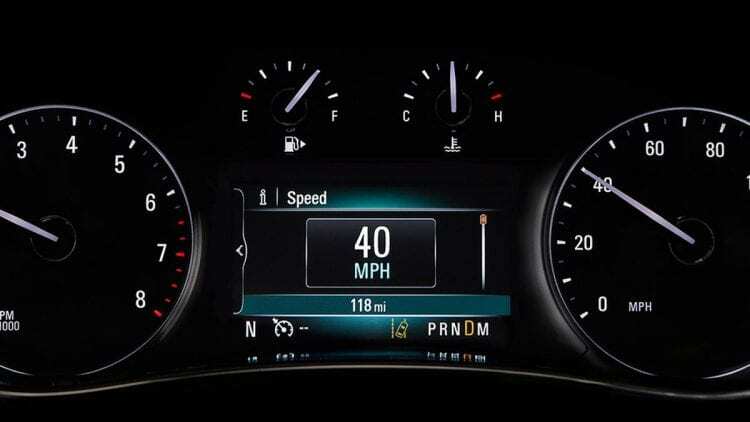 In front of the driver and just behind the steering wheel you’ll now find a better gauge cluster featuring a 4.2-inch information screen. It’s capable of showing you most vital statistics as well as the regular tachometer and speedometer. The old center stack seemed out of place. Thankfully this new one is integrated into the horizontal dash beautifully and seems up-market. The main screen is located in the middle of the dash, and it’s a massive eight-inch display which employs a frameless design, something we are used to seeing in higher class vehicles. It shows the latest IntelliLink infotainment system with smartphone integration. Both major smartphone OS’s is supported, and it works well with Android just as well as it does with iOS. Similarly to all other cars fitted with this infotainment system the Encore too has OnStar 4G LTE Wi-Fi hotspot. The materials themselves have been upgraded so that now there are absolutely no rough surfaces anywhere in the car. What was left of the somewhat questionable plastics is now gone and in its place lie soft plastics and beautiful leather. The seats are comfortable and supportive, but they do lack a bit of lateral support especially if you decide to attack sharp corners at higher speed. That’s nothing major since the primary goal of compact crossover like this one is to offer a higher level of luxury and more comfort. For a car this size legroom and headroom in both rows of seats is great, but five adults will struggle to travel comfortably on longer journeys. 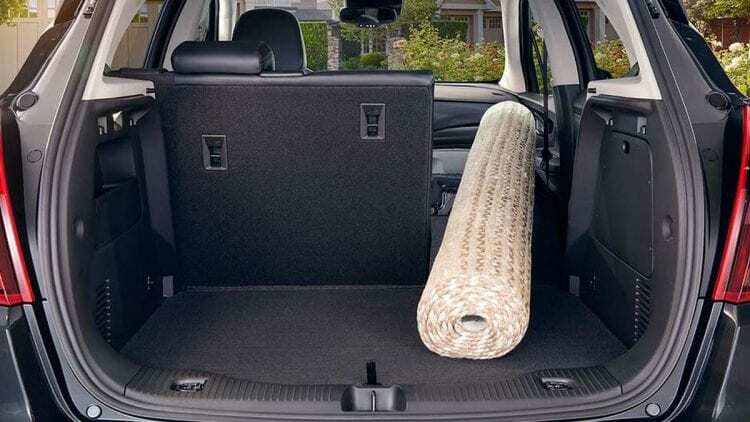 Cargo space stands at 48.4 cubic feet if you fold the rear seats flat, but lift them up and you’re suddenly left wishing for more. Still they do fold 60/40 giving you easy access and loading of even bulkier items. The upright style of the Encore means it can carry even taller stuff, and we include passengers in that. Even tall people will be comfortable in the back although you might want to limit the number of passengers to 4 if they’re going to be taller full-sized adults. There are lots of areas where the Encore is similar to its sister models from Chevy, Vauxhall or Opel. However, sound deadening is not one of them. Because the Encore is much more of a premium vehicle, so it’s been especially insulted to protect occupants from wind and road noise. It does this with Bose’s excellent Active Noise Cancellation system. You might recognize this system from more expensive luxury limos like Mercedes or even Lincolns. 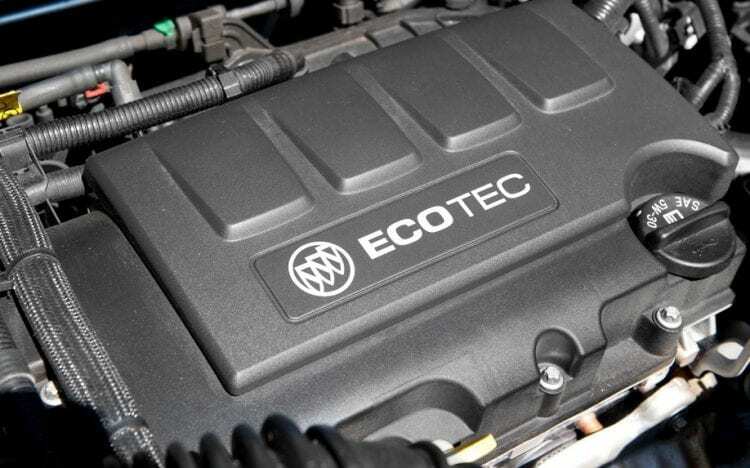 The Encore comes with a single engine option in the form of a very good turbocharged 1.4-liter four-cylinder. It’s a transversely mounted engine which develops 138 hp and 148 lb-ft of torque. Go for the Sport Touring Edition, Leather or Premium models however and you’ve suddenly got 153 hp and 177 lb-ft of torque to play with. The more powerful engine option comes with a start/stop system to save more fuel. Everything is well combined here, but we could hear many customers that would like to see something more powerful in the offer, and we can only hope that one of the next models will fulfill these wishes. Like most cars in the segment, the standard version comes with a front-wheel drive system although there is an all-wheel drive option available. The system still acts as a front-wheel drive one for most of the time and power is sent to the rear wheels only when it detects slippage for the front ones. The 2017 Buick Encore should return 25/33 miles per gallon on city/highway driving respectively although the all-wheel drive version returns 23/30. Adding more power to the small engines proves the theory once again, since, with more power it doesn’t have to struggle as much to pull the body. As such, the 153 hp version gets 28/34 mpg or 26/32 if fitted with the all-wheel drive system. Both may come as a surprise to many people but note that these are actual figures you’re looking at. The Encore remains one of our personal favorites in its segment. It’s powerful, fuel efficient and most importantly luxurious and up-market. It could be yours at a price of around $24,000 for the base model which is in line with 2016 version. More details on official Buick website. These small SUV’s never really were my thing. Always thought that they don’t serve any purpose. But now that I look at this Encore Buick, it looks like something I would bought for a family member. Car fitting of the year 2017. Elegant design, solid performance, not great but acceptable engine options. Price is icing on the cake, it is money well worth spending for this Buick crossover.